Raymond Ernest Grayston was born on 13 October 1918 in Dunsfold, Surrey, and worked as an automobile engineer before the war. Like many young men of his generation, Grayston was fascinated by flying and volunteered for the RAF at the beginning of the war. In a TV documentary to mark the 60th anniversary of the Dams Raid he described how he loved riding a motorbike at speed, and that this was one of the things which encouraged him into the air force. Initially he served as ground crew but then, along with many others who were mechanically minded, he was selected to train as a flight engineer on the new generation of heavy bombers which needed more personnel. He was posted to 50 Squadron in October 1942, and teamed up with Les Knight, who had just formed a new crew. 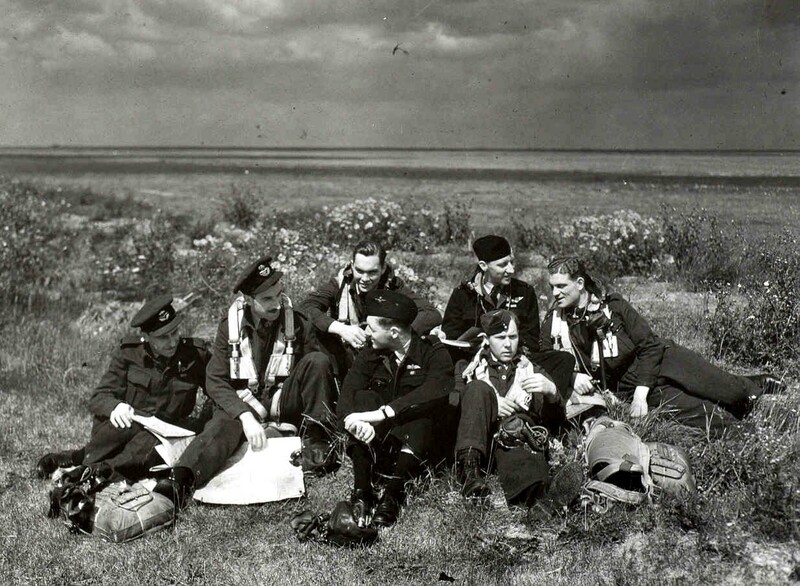 He flew on some 18 operations with this crew before they were posted en bloc to 617 Squadron in March 1943. The teamwork needed between the flight engineer and pilot was never better exemplified than in AJ-N’s successful hit on the Eder Dam. The precision required to get the aircraft into position and the skill need to keep it airborne after the hit required them both to act together and have complete confidence in each other. On their final flight together, on the night of 15/16 September 1943, eight crews were sent to attack an embanked stretch of the Dortmund-Ems canal. The leader was shot down en route and the remainder encountered fog in the target area. While searching for the canal, Knight’s aircraft hit trees, damaging the two port engines and tail unit. The 12,000lb bomb was jettisoned, and Knight and Grayston managed to coax the aircraft to 1,400ft to allow the crew to bale out. With two dead engines and limited control, Knight had little chance of escaping. Grayston was the last to leave the aircraft, saying a final farewell to his captain. Knight didn’t escape and only three Lancasters returned from the raid. After leaving the RAF he joined Hawker Siddeley and worked as a quality inspector, retiring in 1984. Like all the other Dambuster survivors who lived into the 2000s, Ray Grayston became something of a celebrity, and was frequently asked to participate in events, documentaries and signings. And, like his colleagues, he took part in these with good grace and great dignity, despite the fact that he must have been asked time and time again about the same events. Grayston married Sylvia Jefferies in 1976. He died in Woodhall Spa on 15 April 2010. Survived war. Died 15 April 2010. Thank you Charles for such a great contribution to the memory of 617 Squadron The Dambusters ,we wish you a merry xmas and a happy new year .. Nigel and Heather ..